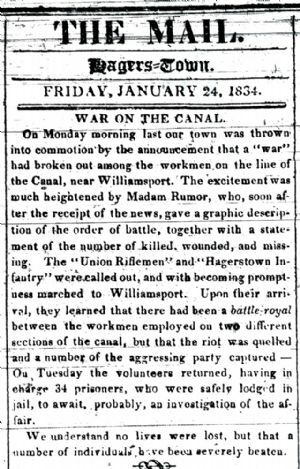 On Monday morning last our town was thrown into commotion by the announcement that a “war” had broken out among the workmen on the line of the Canal, near Williamsport. The excitement was much heightened by Madam Rumor, who, soon after the receipt of the news, gave a graphic description of the order of battle, together with a statement of the number of killed, wounded, and missing. The “Union Riflemen” and “Hagerstown Infantry” were called out, and with becoming promptness marched to Williamsport. Upon their arrival, they learned that there had been a battle royal between the workmen employed on two different sections of the canal, but that the riot was quelled und a number of the aggressing party captured. — On Tuesday the volunteers returned, having in charge 34 prisoners, who were safely lodged in jail, to await, probably, an investigation of the affair.